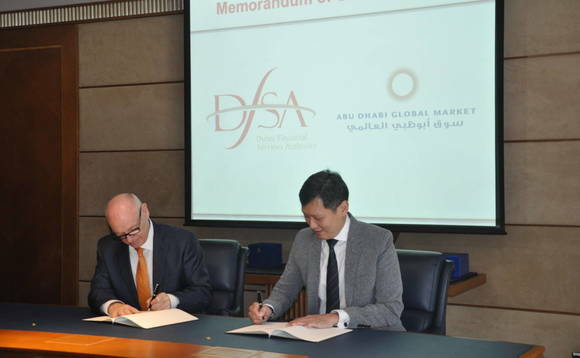 The Dubai Financial Services Authority (DFSA) today entered into a memorandum of understanding with the Financial Services Regulatory Authority (FSRA) of the Abu Dhabi Global Market (ADGM). The MoU was signed on behalf of the DFSA by its chief executive Ian Johnston, and on behalf of the FSRA by chief executive officer, Richard Teng, at the offices of the DFSA (pictured right). “The DFSA is pleased to engage with its counterparts in the GCC and especially with a fellow regulator in the United Arab Emirates,” said Johnson. “As regulators of financial centres, founded on Common Law principles, we embrace best practice and apply regulation which meets the requirements of the international standard-setters: the Basel Committee on Banking Supervision; the International Organisation of Securities Commissions; the International Association of Insurance Supervisors; and the Financial Action Task Force. Johnson said that effective co-ordination and co-operation between regulators “cannot be overstated” and added that the DFSA has concluded almost 100 (97) MoUs with its counterparts since its establishment in 2004. The agreement, he adds, also builds on the agreements already signed with other UAE regulators, including; the Central Bank, the Securities and Commodities Authority and the Insurance Authority. Richard Teng, chief executive, FSRA added that the MoU with the DFSA underscores FSRA’s commitment to “foster greater investor protection” and support the development and innovation of regulations and supervision in the UAE and wider region.